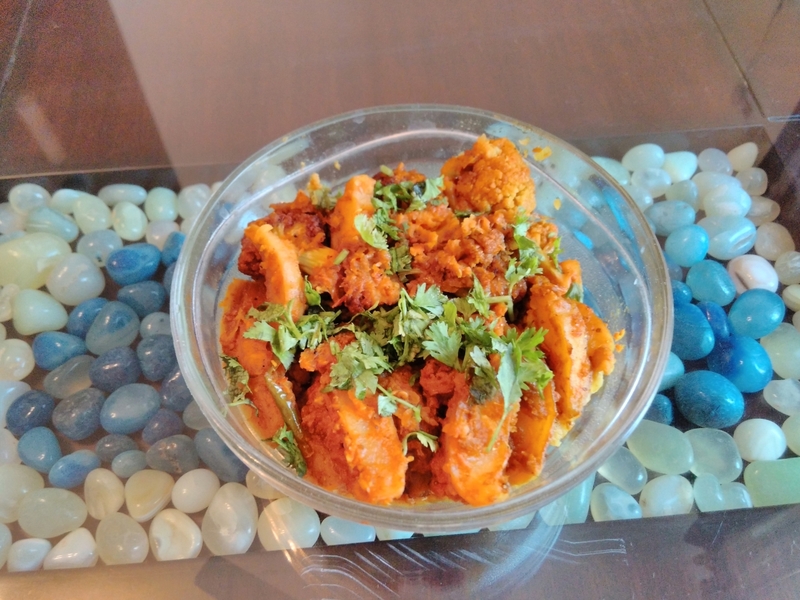 Deep fried cauliflower florets and potato chunks in a delicious tempering, this vegetarian Indian dish is almost a household name across North India. Easy to prepare, it can easily fit into any menu, whether informal or party, and delight foodies. Kids will love the texture of the fried veggies too. Put oil in a deep frying pan and put it on medium-high heat. Once the oil heats up nicely, deep fry potatoes and cauliflower florets on medium heat alternatively till golden brown. Put some oil in a shallow frying pan or wok and place on heat. Add cumin seeds and when they crackle, add chopped onion. Saute until golden brown and then add chopped tomatoes in it. Cook until tomatoes get nicely cooked and get mixed with onions. Add all dry spices except garam masala. Add curd and cook for 2 more minutes on low heat until oil separates from the tempering. Put ½ cup water in the pan and let it come to a boil. Then put fried cauliflower and potatoes in it and toss well. Let it stay on low heat covered for 2-3 minutes so that the tempering and spices get infused into the dish. Sprinkle garam masala and chopped coriander on top and transfer into a serving dish. Serve hot with chapatti or parantha. Tip: Don’t fry the veggies on high heat otherwise they will turn brown but will not become tender.